colors at the Veterans Luncheon. Veterans and their families packed the Longhouse at the Hibulb Cultural Center & Natural History Preserve on Monday, November 11th. 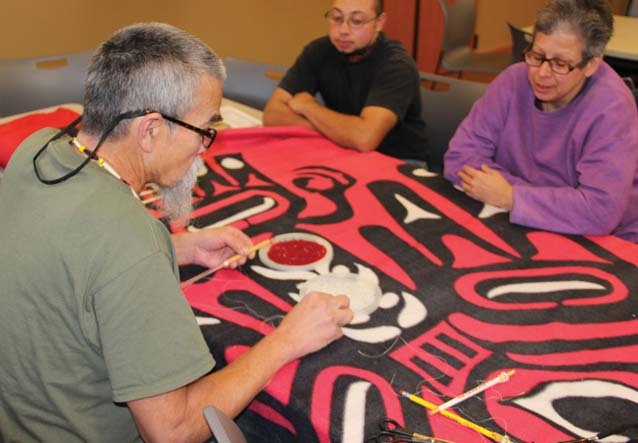 The event hosted by Hibulb staff, which was open to all veterans in the Tulalip community, featured a lunch incorporating traditional foods in addition to an honoring and healing ceremony. Veterans that spoke reminded those in attendance about the sacrifices made by soldiers and their families, emphasizing the importance of remembering the cost of the world we live in. 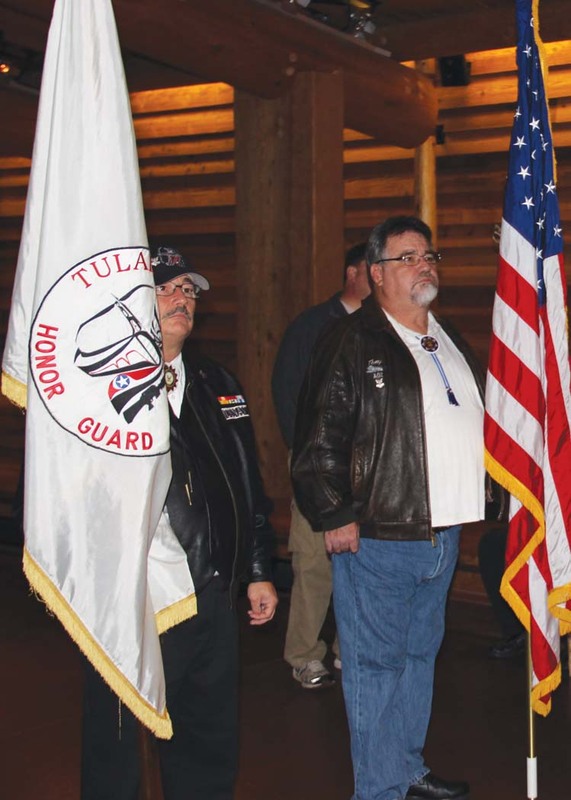 With the presentation of the colors by the Tulalip Honor Guard, the Veterans Day celebration began. Each veteran was thanked with a blanket, introducing themselves while taking a moment to speak about their service. Some listed their rank and various wars and theaters, while others spoke about what Veterans Day means to them. Tulalip Tribal veteran Ray Moses telling war stories at the healing ceremony. Korean War veteran Ray Moses spoke about the horrors of war. Richard Muir Jr. holds a beading seminar for Veterans Day at Hibulb. He is demonstrating the technique called Peyote Stitch. Hibulb staff served a lunch of fry bread and hamburger stew, along with traditional foods including mushrooms, nettle tea, and black moss pudding, which in our culture is a medicine for calming the spirit and mind. 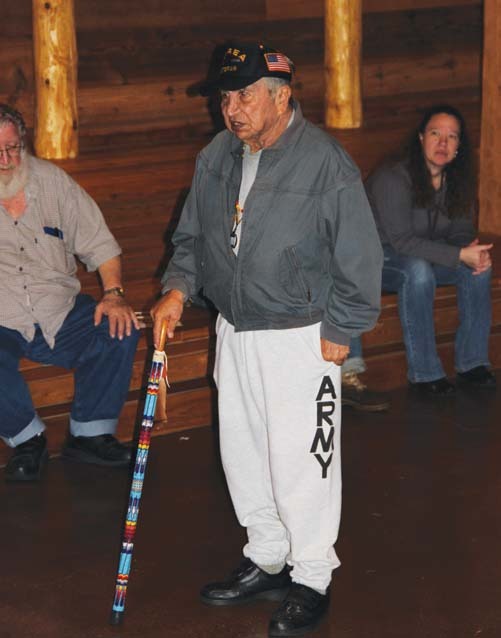 This entry was posted in Arts & Entertainment, Local News, News, Tulalip News and tagged honoring ceremony, Tulalip Hibulb Cultural Center, Tulalip Veterans by Kim Kalliber. Bookmark the permalink.